ROME (CNS) — The concern of now-retired Pope Benedict XVI and the promises made by the majority of church leaders were not able to stop the evil of clerical sexual abuse, which has been the 9/11 of the Catholic Church, the retired pope’s personal secretary said. “No one, so far, has attacked the church of Christ with airlines full of passengers. St. Peter’s Basilica is still standing” as are other symbolic churches in the Western world, he said, according to news reports. “And yet, the news coming from America that recently informed us about how many souls have been irreparably and mortally wounded by priests of the Catholic Church, gives us a message (that is) even more terrible than if there had been news that all the churches in Pennsylvania had suddenly collapsed together with the Basilica of the National Shrine of the Immaculate Conception in Washington,” he said. Having mentioned the basilica, the archbishop said he was reminded “as if it were yesterday” of when he accompanied Pope Benedict there April 16, 2008. The pope, who also visited New York on that trip, gave a lengthy speech to the nation’s bishops at the shrine. In the portion of his talk dedicated to the sexual abuse of minors, Pope Benedict “tried poignantly to shake the bishops assembled from all over the United States,” the archbishop said. 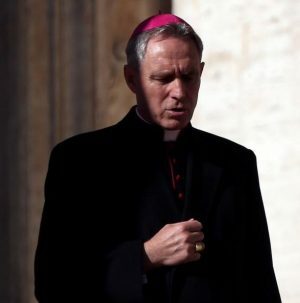 Archbishop Ganswein has worked with the retired pope since 1996, first serving on the staff of the Congregation for the Doctrine of the Faith and later becoming then-Cardinal Joseph Ratzinger’s personal secretary in 2003.